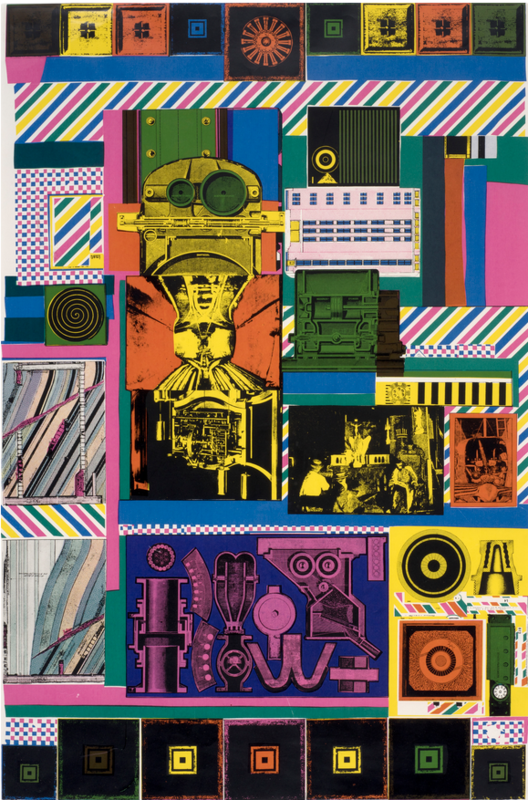 EDUARDO PAOLOZZI (1924-2005): Conjectures to Identity (1963). Including works by Stanley William Hayter, Ian Hamilton Finlay, John Furnival, R.B. Kitaj, Gillian Ayres, Prunella Clough, Allen Jones, Eduardo Paolozzi, Richard Smith, Joe Tilson, William Turnbull and Paule Vézelay. In the 1960s, British printmaking was renewed by artists moving away from traditional techniques and working with new methods derived from technical advances, particularly the mechanical screenprint. Building on the example of American artists, British artists made use of the possibilities of silkscreen printing and the new developments in lithography that could incorporate photographic imagery and collage. Pop and Pop art made British printmaking a vibrant, accessible medium that reflected contemporary culture and enabled artists to disseminate their work to a wider audience. In 1964, a ground-breaking portfolio of screenprints by twenty-four artists was commissioned by the Institute of Contemporary Arts, London. The artists were selected by the artist Richard Hamilton and the works screenprinted in an edition of 40 at the Kelpra Studio. This selection of prints from the period includes a group of the ICA portfolio screenprints. By the mid 1970s, the Tate gallery had begun to collect contemporary prints by British artists, which led to further interest in printmaking in the UK. This is the first of a series of planned displays from England & Co’s archive of prints. The image shown here is by EDUARDO PAOLOZZI (1924-2005): ‘Conjectures to Identity’ (1963). Screenprint, 31.25 x 20.5 inches. Signed, dated, inscribed with edition number 31/40. Printed by Kelpra Studio, London in an edition of 40 and published in The ICA Print Portfolio by the Institute of Contemporary Arts (ICA), London, 1964.